Three scholarships in the amount of $750.00 each. 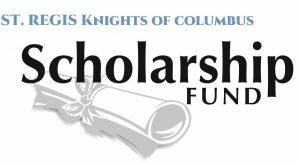 If you are a Knight of Columbus or a Columbiette, in good standing and have a child or grandchild or a Squire or Squirette who is entering a Catholic High School or going off to ANY college, in 2019 you may want to apply for one of the awards. Please, no name on essay, but include a separate sheet with student’s name, address, and phone number and relationship to member.